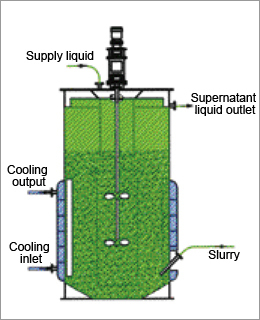 Slurry Concentration Crystallizer | KATSURAGI INDUSTORY CO.,LTD.- Dryers,Drum Flakers,Concentrators,Crystllizers. 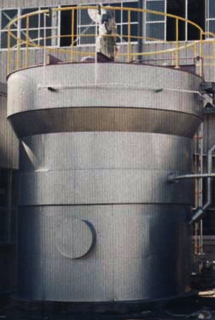 This crystallizer is of a structure in which supernatant liquid not containing crystals is separated, and precipitated crystals can be concentrated in the crystallizer. Thus, when precipitated volume in one path is extremely small, this can display its power. In particular, when solute accumulated as impurities in the surface treatment line is precipitated by using temperature difference or through reaction to recover treated fluid, size of the crystallizer can be reduced. Crystals can be separated intensively, allowing substantial labor saving.